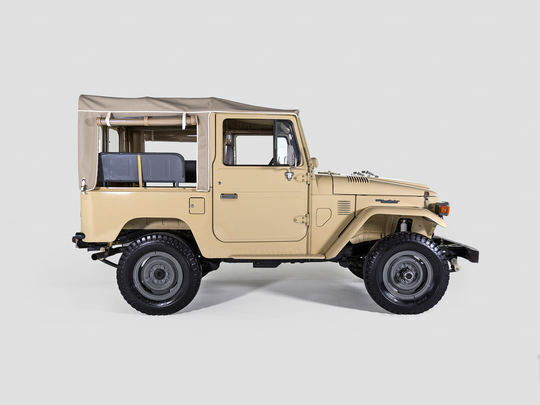 This striking Land Cruiser received our complete nut and bolt restoration. 1984 was both the last year that FJ40's were produced and one of the best production years in the car’s history. This particular 40 was in great shape prior to restoration, making it an ideal candidate for a serious collector. We were trusted with giving the vehicle a complete restoration, including an engine/transmission rebuild, new interiors, paint job, new custom top, and much more. Our client wanted the vehicle restored to near-factory specs, so we kept the original Toyota 2F, the 4-speed manual transmission, original Toyota steel wheels (no hubcaps! ), and even the original suspension. Interested a 40 series like this one? Build your own.